With coupon use on the rise and our rapid increase of readers and facebook fans just getting started Couponing, it’s time for me to pick up our FAQ Series of Posts with some more Couponing 101 Lessons & Tips. 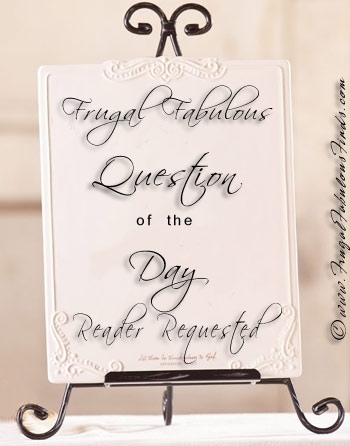 The quick answer is …. YES !! Yes, you can combine paper and electronic coupons. 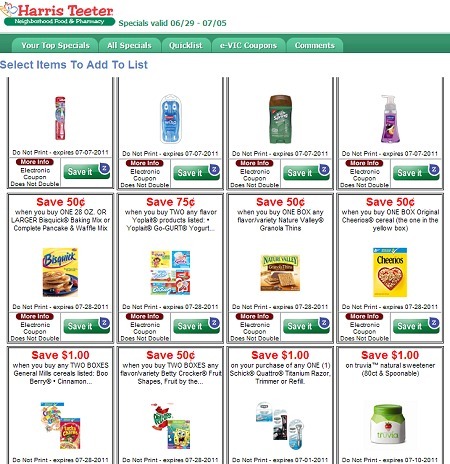 E-Vic Coupons, which you can load to your Harris Teeter E-Vic savings card each week are available ONLINE HERE are fairly new and a great way to maximize savings at Harris Teeter. E-Vic Coupons are excluded from Doubling, Super Doubles and Tripling events-you can still use them but they will not double/triple/etc. You simply select the coupons you want from their website and save to your Vic card. They will always deduct the face value when you purchase that item and you’ll see them on your receipt. You can have up to 99 coupons saved to your account at any one time and make sure to note that expiration dates appear on each coupon and will vary by offer. It’s another very simple way to stack coupons (which is rare at grocery stores) and get the most for your money that is often overlooked by many. The coupons offered are usually for high demand products/brands that you very likely have paper coupons to stack with. Here’s a screencap I took before I loaded the new ones to my card for this week. If you shop Harris Teeter, you definately want to take advantage of these extra savings!